It has been nine months since Gordy and his friends, Max and Adilene, Saved B.R.E.W. (the Board of Ruling Elixirists Worldwide) and the Vessel—the power source for the secret society of potion masters. Now, Gordy is starting the eighth grade, and has been trying new potion brewing techniques, but when he starts zoning out during practice, he knows something is wrong.Gordy and his friends continue to work on their potions, but when Gordy chooses Max as his lab partner, Adilene starts to wonder if she still has a place with her old friends. She turns to a new friend, Cadence, who might know a way to help Adilene become a potion master on her own.And in Greenland, Mezzarix has a chance to escape his Forbidden Zone—as long as he agrees to work with the mysterious Ms. Bimini and replicate an unusual solution known as “Silt.” It could be just the weapon Mezzarix needs to destroy B.R.E.W. forever.With both B.R.E.W. and the Vessel in danger, and with the potion world in chaos, it’s up to Gordy, Max, and Adilene to rally the remaining Potion Masters before it’s too late. The Transparency Tonic is another wild, exciting ride from Frank Cole. I love Frank's books. They are always full of adventure, clever plots, characters you care about, and fun twists and turns. This book had all that, and more. I loved it! Gordy is one smart kid, with an amazing ability. I love Gordy's mom and Aunt Priss. There are so many exciting things that happen in this book. It is so fun and clever. The bad guys are inventive and there are characters that keep you guessing. The last few c The Transparency Tonic is another wild, exciting ride from Frank Cole. I love Frank's books. They are always full of adventure, clever plots, characters you care about, and fun twists and turns. This book had all that, and more. I loved it! Gordy is one smart kid, with an amazing ability. I love Gordy's mom and Aunt Priss. There are so many exciting things that happen in this book. It is so fun and clever. The bad guys are inventive and there are characters that keep you guessing. The last few chapters of this book had me frantically turning pages to find out it was going to happen. 5 out of 5 stars. So many awesome twists and turns, I loved them all and a fantastic ending. You can view my participation in the blog tour for The Transparency Tonic here at Booked J. I was sent an ARC of this novel from the publisher in exchange for my honest review and participation in the blog tour. This does not change my view in any shape or form. This review will be spoiler free! However, there are likely to be spoilers for the first book in the Potion Masters series so if you haven't read it yet (WHY?????) now is the time to back away and snag yourself a copy. Seriously, the Pot You can view my participation in the blog tour for The Transparency Tonic here at Booked J. I was sent an ARC of this novel from the publisher in exchange for my honest review and participation in the blog tour. This does not change my view in any shape or form. This review will be spoiler free! However, there are likely to be spoilers for the first book in the Potion Masters series so if you haven't read it yet (WHY?????) now is the time to back away and snag yourself a copy. Seriously, the Potion Masters series is can't-miss-reading material and one of the best middle grade novels in recent memory. I'm having so much fun with these books! It's really no secret that I practically (see: absolutely) devoured the first installment to Frank L. Cole's dazzling Potion Masters series late last year. It should come as no shock to you that I found myself highly anticipating the second installment, The Transparency Tonic, and squealed when I reading it no less than seventeen times. Once again, Cole hooks his readers within the first few pages and weaves an incredibly fun read for all ages. The Transparency Tonic takes place nine months after the events of the previous installment and a lot has changed since then. Gordy and his best friends, Max and Adilene, have grown comfortable in the fact that they defeated the villainess Esmeralda and saved B.R.E.W. and the Elixirists main source of power: the Vessel. But when a new threat arises, and Gordy begins experiencing peculiar moments, it becomes apparent that something is brewing--and it's not good. First of all: I loved catching up with the gang! Gordy, Max and Adilene are just as brilliant as usual. Once the action begins, the stakes for B.R.E.W. (the Board of Ruling Elixirists Worldwide) are even higher in The Transparency Tonic. Armed with familiar friends and foes, and new faces sprinkled in, readers are thrown right into the thick of it pretty much from the start. Throughout the book, we learn several new facts about B.R.E.W. and the perils that may lay ahead for the organization, should the Dark Elixirists manage to take control over life as Gordy knows it.Frank L. Cole's imagination knows no bounds as he continues to expand the world of B.R.E.W. and take readers on new adventures. The battle between good vs. evil continues to extend in the Potion Masters world and it will leave readers breathless before they can say Fusion Potion. Each page is cleverly crafted with action, humor, science and more. This winning combination makes The Transparency Tonic impossible to put down. One thing's certain: Cole is only just getting started with Gordy's adventures, and I cannot wait to see what more is in store for the Potion Masters. I love finding books that I can enjoy on my own, or reading with my kids. This book is one of those! The first thing that you need to do though is read the first one! Potion Masters: The Eternity Elixir was also great! You’re not going to understand this one without having read that one though.The main character in this book is Gordy. He’s in eighth grade. And he can make crazy potions that do all sorts of things. One of my favorites is the one that makes the ground turn to quicksand, sucking wh I love finding books that I can enjoy on my own, or reading with my kids. This book is one of those! The first thing that you need to do though is read the first one! Potion Masters: The Eternity Elixir was also great! You’re not going to understand this one without having read that one though.The main character in this book is Gordy. He’s in eighth grade. And he can make crazy potions that do all sorts of things. One of my favorites is the one that makes the ground turn to quicksand, sucking whoever is on top in and freezing them in the earth in a matter of seconds. That potion would have come in handy many times over the years!Gordy has all kinds of crazy things happen to him in this one. That’s part of what makes this series so much fun! Some of his problems come from bad guys, but some of the problems are his own making. Gordy is left to figure out a lot of things on his own, making him a character that a lot of boys can learn from and emulate in their own lives.I liked that this book also has parts where the reader can see though the eyes of other characters. The reader grows to learn Adilene a little bit better because of that. I love that Adilene is able to help Gordy when he needs it the most.And the reader even gets to see things through the bad guys eyes for part of it! That’s always fun too. It’s fun to be able to yell at characters not to do things, if you know in time what they shouldn’t do. This book though, the reader didn’t know exactly what was going to be happening. Making the whole thing so much fun!If you’ve got a middle grade boy or girl, they’re going to love this one. It’s really well done and perfect for that age! Gordy and the gang are back in The Transparency Tonic and are out to keep B.R.E.W. safe. It has been about a year since I read the first book and this one was just as enjoyable. I read a lot so it did take me a short time to get back into the swing of the story and the characters, but once I refamiliarized myself it was like I had just finished the first book. The author has a way of weaving a tale and making it enjoyable for all ages, not just the younger crowd. I enjoyed the creativity of t Gordy and the gang are back in The Transparency Tonic and are out to keep B.R.E.W. safe. It has been about a year since I read the first book and this one was just as enjoyable. I read a lot so it did take me a short time to get back into the swing of the story and the characters, but once I refamiliarized myself it was like I had just finished the first book. The author has a way of weaving a tale and making it enjoyable for all ages, not just the younger crowd. I enjoyed the creativity of the characters when dealing with various situations and the potions that Gordy would come up with was ingenious.There was one chapter that at first I felt was out of place with the flow of the story until I arrived at the end of the said chapter and then it all made much more sense. I don't want to give away too much of the story but let's just say that things are not as they seem.There is a young girl that is introduced that just set off all sorts of bad vibes for me. I just had this feeling there was more to her story and what she was there to do than what was portrayed.I have to say that this book does give me a good chuckle with the antics of Gordy, Max, and Adeline. Even some of the adult characters are a bit mischevious and find themselves in some sticky situations.The story ends well but does leave it open for future books and a continuation of the Stitser family. I am was so excited to be able to review this book. The first book was soooo good, and I knew it would only get better from there.Once upon a time there was a boy named Gordy who was an amazing potion maker. His mother saw something in him that both excited her and terrified her. She knew that her boy was special, and that might get him in trouble some day. He has already had to face trials, but this new adventure brings even more. Mezzarix, is Gordy's grandfather, and he is a master at potion m I am was so excited to be able to review this book. The first book was soooo good, and I knew it would only get better from there.Once upon a time there was a boy named Gordy who was an amazing potion maker. His mother saw something in him that both excited her and terrified her. She knew that her boy was special, and that might get him in trouble some day. He has already had to face trials, but this new adventure brings even more. Mezzarix, is Gordy's grandfather, and he is a master at potion making. He was so good, and so evil he was banished to Greenland for the safety of everyone. Gordy has only met him a few times, and has learned how dangerous he can be. Regardless, Gordy loves him.During this adventure we get to see a more advanced Gordy start doing things with potions his mother never imagined. Some good, and some good, but not too sure about. Gordy is a master at getting in trouble. Along with his two friends Max and Adilene. They seem to have an eye for where trouble is.There are people after Gordy and his family and they seem to be constantly on the look out for dangers. This story is full of adventure, intrigue, excitement, and friendship. Who knew family could be so dangerous, and wonderful at the same time. Follow Gordy and his friends as they face some unsavory people trying to bring him and his family down, along with B.R.E.W. People want to do away with B.R.E.W. and Gordy and his family are trying to keep that from happening. I enjoyed this story so much. I finished the book in a day. I love the setting, the story, and the world this book brings to me. I have to say that I felt like I was right along side Gordy during this whole story. I love it when a book can do this for me. It is a great book for middle schooler's, because Gordy is the same age. I know that my son would really enjoy this series, but I also think its great for people like me who love to dive into the middle grade genre once in a while. They are just so fun.Cole's writing is amazing, and brings a whole new world to life for you. I hope you take the opportunity to pick this book up. You won't regret it. I read this one with my 8yo twins and we all enjoyed it. It’s the second in a series, and I’d suggest reading the first book first. I’m not sure how many more books there will be, but there’s at least one more, and we’re looking forward to reading it.This series takes middle-grade readers into the potion-making community, a group of talented elixirists and drams (elixirists-in-training) hidden within a normal contemporary world. There are the good potion-makers, organized and governed by B.R.E.W I read this one with my 8yo twins and we all enjoyed it. It’s the second in a series, and I’d suggest reading the first book first. I’m not sure how many more books there will be, but there’s at least one more, and we’re looking forward to reading it.This series takes middle-grade readers into the potion-making community, a group of talented elixirists and drams (elixirists-in-training) hidden within a normal contemporary world. There are the good potion-makers, organized and governed by B.R.E.W., some downright evil scourges, and a group that’s kind of in-between—not necessarily evil, but not necessarily lawful either. This book expands on the world-building from book one and adds in a host of intriguing characters. Gordy, the main character, is a dram, and a really good one. I enjoyed watching his progress as he learned and developed his skills. (I think the blind-batching parts were my favorites.) Gordy’s grandpa, Mezzarix, is also a talented elixirist, but he’s working to destroy B.R.E.W. When he escapes from his exile in Greenland, the entire potion community is at risk. And since potions are the basis for much of the world’s technology, that could be very bad for everyone, even for normal people. Side note: (view spoiler)[I really enjoyed Mezzarix as a villain. I was happy to see the book end with him having the upper hand. It leaves open some awesome possibilities for book three. (hide spoiler)] Complicating everything is Mrs. Brexil, the new head of B.R.E.W. She’s not afraid of cruel and unusual punishment, she butts heads with Gordy’s mom, and Gordy’s skill makes her nervous.This book isn’t actually released yet. The author hosted a potion-naming contest on his Facebook page, and I told my kids to suggest a few. One of theirs won, and we got a signed ARC. This. This is a fantastic series. The first book POTION MASTERS: THE EXTERNITY ELIXIR was fantastic. And this next installment is equally as good. The creative potions that are brewed, the twists and turns in the plot, the action level, everything about it is incredible. I had so much fun reading it. I couldn't turn the pages fast enough. My kids are sure to love this one, as will all their friends and anyone else who will take my suggestion. I highly recommend this story and can't wait for the This. This is a fantastic series. The first book POTION MASTERS: THE EXTERNITY ELIXIR was fantastic. And this next installment is equally as good. The creative potions that are brewed, the twists and turns in the plot, the action level, everything about it is incredible. I had so much fun reading it. I couldn't turn the pages fast enough. My kids are sure to love this one, as will all their friends and anyone else who will take my suggestion. I highly recommend this story and can't wait for the third book. Fun books and wow what an ending! I think I need book 3 right about now. This is really a great series! A most creative book and quite engaging for a wide range of readers. I would gladly recommend The Transparency Tonic to young adults as well as seasoned literacy vets. Interesting, riveting, and well worth the read. I received this book as an advanced readers copy in exchange for my honest review. I have read the first book and enjoyed it very much because it was imaginative and entertaining enough that it was a very quick read and our patrons that I've recommended the book to have enjoyed it as well.The second book was a lot like the first book being just as imaginative and entertaining as the first book. This will definitely make our young patrons excited and we definitely will be adding this book to our I received this book as an advanced readers copy in exchange for my honest review. I have read the first book and enjoyed it very much because it was imaginative and entertaining enough that it was a very quick read and our patrons that I've recommended the book to have enjoyed it as well.The second book was a lot like the first book being just as imaginative and entertaining as the first book. This will definitely make our young patrons excited and we definitely will be adding this book to our collection and that is why we give this book 5 stars!! Cole, Frank. The Transparency Tonic. Shadow Mountain, 2019.Gordy is continuing his education as a dram at B.R.E.W., aided by his friends Max and Adilene. His family has moved into a new house, and there is a new principal at Gordy's school as well. The principal's daughter is a dram like Gordy, but Gordy thinks there's something odd about her and her family. Meanwhile, Gordy's grandfather, who has been exiled in a cave in the frozen north, has escaped and is pursuing means to make his escape per Cole, Frank. The Transparency Tonic. Shadow Mountain, 2019.Gordy is continuing his education as a dram at B.R.E.W., aided by his friends Max and Adilene. His family has moved into a new house, and there is a new principal at Gordy's school as well. The principal's daughter is a dram like Gordy, but Gordy thinks there's something odd about her and her family. Meanwhile, Gordy's grandfather, who has been exiled in a cave in the frozen north, has escaped and is pursuing means to make his escape permanent. Gordy may be the only potion master with the skills to stop his grandfather, but will he be able to make it in time? This is a delightful adventure tale that fits right in with the first book in this series. The antics of Max will keep kids laughing, and the trio are reminiscent of Harry, Ron, and Hermione with their penchant for getting in trouble and the adventures they find themselves in. The action sequences carry this story and will have readers turning pages to find out what happens next. Give to fans of the Harry Potter series, the many Rick Riordan series, or the Iron Trial. Recommended for: tweensRed Flags: some intense action and mild fantasy perilOverall Rating: 4/5 starsI received a complimentary copy of this book through Netgalley for the purpose of review. "This is book 2 in the series. I enjoyed this as much as I enjoyed the 1st book. This is a quick paced book and develops quickly. I do recommend reading book 1 before reading this one.I received this from NetGalley in exchange for my honest review." Gordy is an elixirist in training. He has been granted special privileges to have two lab assistants. His mom is his adviser at B.R.E.W, at least until she is suddenly demoted by her new boss. Aunt Priss hasn’t been seen in a long time. And, the new principal and his daughter (Sasha Brexil) could be a problem. Especially, since Sasha is also an elixirist in training. B.R.E.W.’s enemies seem to be mounting a war with Gordy and his family stuck in the middle. Could Gordy’s exceptional abilities ge Gordy is an elixirist in training. He has been granted special privileges to have two lab assistants. His mom is his adviser at B.R.E.W, at least until she is suddenly demoted by her new boss. Aunt Priss hasn’t been seen in a long time. And, the new principal and his daughter (Sasha Brexil) could be a problem. Especially, since Sasha is also an elixirist in training. B.R.E.W.’s enemies seem to be mounting a war with Gordy and his family stuck in the middle. Could Gordy’s exceptional abilities get him exsponged of his powers forever? And, who is Adeline’s mysterious new friend? This is a wonderful middle grade fantasy series that keeps getting better. It is a great match for fans of Brandon Mull, Leven Thumps, and Harry Potter. Grades 3 – 8. This was a fun sequel to the first book, The Eternity Elixir. I took longer than expected to read this particular book, but I also enjoyed it quite a bit. I did receive an advance reader's edition from Shadow Mountain Publishing as part of a Goodreads giveaway. I was neither compelled not incentivized to post a review of the book. I do feel that leaving a review is fair trade for receiving a free book.I recommended this book as an audiobook to my local library as soon as I could, which was a cou This was a fun sequel to the first book, The Eternity Elixir. I took longer than expected to read this particular book, but I also enjoyed it quite a bit. I did receive an advance reader's edition from Shadow Mountain Publishing as part of a Goodreads giveaway. I was neither compelled not incentivized to post a review of the book. I do feel that leaving a review is fair trade for receiving a free book.I recommended this book as an audiobook to my local library as soon as I could, which was a couple of months ago. Regardless of whether they but it or not, my recommendation stands. I sincerely hope they do buy an audiobook copy as I often enjoy more audiobooks than physical copies these days. Gordy's prowess as an elixirist increases in this book, in part because he can decipher which ingredients are in a potion. There's obviously more going on as he begins to blind batch concoctions which should be beyond him. His abilities earn the attention of the chamber president at B.R.E.W., and not for any good outcomes.Full of fun narrative and engaging ideas this book in a fun addition to the series. This was a roaring second book in the series. The first book had to do the world building, and I understand that. This one did not wait one second before launching into the action. Poor Gordy is beset with issues. He had to move, his mom is in trouble at work, and wait, who is this new girl and how can he get his training without a lab partner?So many details. I loved the back and forth here, the way that Gordy is pulled in multiple directions, and his issues feed into his friend's Adilene's iss This was a roaring second book in the series. The first book had to do the world building, and I understand that. This one did not wait one second before launching into the action. Poor Gordy is beset with issues. He had to move, his mom is in trouble at work, and wait, who is this new girl and how can he get his training without a lab partner?So many details. I loved the back and forth here, the way that Gordy is pulled in multiple directions, and his issues feed into his friend's Adilene's issues so that she is tempted by another new mysterious girl to do things she otherwise would not have done. I mean, isn't this what junior high was like? All questioning, lacking self confidence, leading to actions that don't really sound advisable.This book opens up the whole potions Community into a much wider world, full of all kinds of populations that we hadn't known about earlier, and brings in more adult characters too, that all have various motivations, some of them very nefarious.The climax was amazing, and the ending was surprising. I loved it. What a ride. This is the sequel to the wonderful first book Potion Masters Eternity Elixir, and it is well worth the wait. This book has just as much action and suspense if not more, you will be reading past your bedtime until you are finished. Gordy and his friends have teamed up again to fight against those that wish to do harm to innocent people and the elixirists at B.R.E.W. like his mom. But strange things have been happening, Gordy brewing strange things and not remembering doing it, the new chancellor This is the sequel to the wonderful first book Potion Masters Eternity Elixir, and it is well worth the wait. This book has just as much action and suspense if not more, you will be reading past your bedtime until you are finished. Gordy and his friends have teamed up again to fight against those that wish to do harm to innocent people and the elixirists at B.R.E.W. like his mom. But strange things have been happening, Gordy brewing strange things and not remembering doing it, the new chancellor at B.R.E.W. who has it out for Gordy's mom, and what about Gordy's grandfather? This book is for you if you like books you just can not put down, and if you haven't read the first one yet well there is still time to get it in before this one comes out. Book one was fun, but book two really upped the stakes on all levels and I enjoyed it! This genre isn't usually my cup of tea -- but this book is AWESOME! It's a fast read and leaves you turning the pages wanting more. 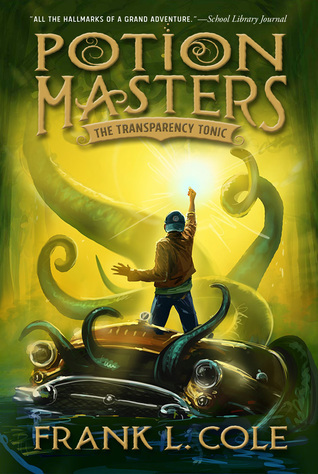 The Transparency Tonic is the second book in the Potion Master series. A quick read for middle readers. Gordy, Max and Adilene are on a mission once again, to find answers to B.R.E.W.S. problems. Gordy is my favorite character, his potion master skills will get him into trouble or help him save his family. This book is action packed and will keep young readers turning pages to find out what happens next. I received an advanced reader's copy of this book through netgalley in exchange for an honest review. I really enjoyed this book! It is the second in a series, and I haven't read the first. I thought I was going to struggle through it, but I didn't have any trouble. Gordy and his two best friends find mischief in a potion making world. There's a couple of bad guys, there were different plots caving in on each other, and it was fast paced. I would totally recommend this series to Harry Potter fan I received an advanced reader's copy of this book through netgalley in exchange for an honest review. I really enjoyed this book! It is the second in a series, and I haven't read the first. I thought I was going to struggle through it, but I didn't have any trouble. Gordy and his two best friends find mischief in a potion making world. There's a couple of bad guys, there were different plots caving in on each other, and it was fast paced. I would totally recommend this series to Harry Potter fans and Percy Jackson fans. As a parent, I can't wait to read this series with my kids as more are released, but this book did well on its own, too. Because Gordy's powers are not fully understood and he cannot fully control them, Gordy, Max, and Adilene face multiple dilemmas. Numerous betrayals and love of friends and family force them to make choices that ultimately have fairly severe consequences. The magic and unexpected plot twists made this an enjoyable, fun book to read. I received this book as part of the Goodreads Giveaway program.